3D printing can do anything, even show off your musical tastes. 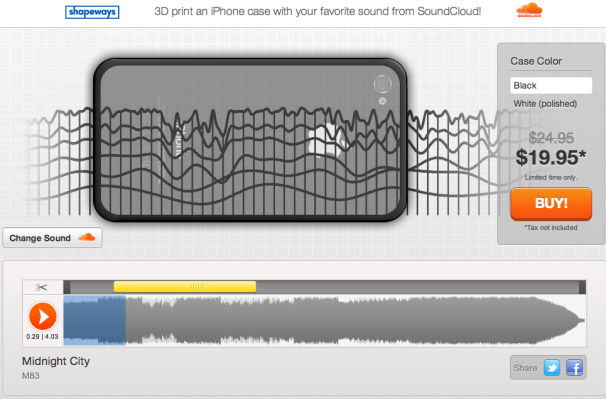 The Vibe, a new app from Shapeways, lets you create a custom, 3D printed iPhone case using the waveform of your favorite music in just a few minutes.The Vibe uses waveform data from SoundCloud (a music sharing service) to create a unique pattern on the back of an iPhone case. You’ll have to sign up with SoundCloud (it’s free) to make your iPhone case, but the process is simple: Just search through SoundCloud’s library for the song you want (I chose M83’s single Midnight City--sax solos are in this year), and The Vibe will automatically bring up the track, along with its waveform superimposed on an iPhone so you can see exactly what your new case will look like. Drag the waveform along to find a part that looks interesting to you, or--and this is the really cool part--just start playing the song and the waveform will scroll along as the music plays. As you play the track, you can match the waveform that appears on the case to your favorite part of the song. The Vibe isn’t limited to just music, either: You can upload an audio recording of just about anything, and make a waveform case from it. The cases cost $20 for a limited time ( Shapeways plans to raise it to $25 eventually), which makes them inexpensive enough to be just on the edge of an impulse buy. If my girlfriend had not already gotten me a great case for Christmas, I’d be printing out a new case each year for my new favorite song. Custom products are the new t-shirts, so here's hoping that Shapeways creates more tools (like The Vibe) to customize the stuff we own. Life’s always better with a little bit of uniqueness. If you want to create your own cool (and classy) iPhone case, head on over to The Vibe to try it for yourself.